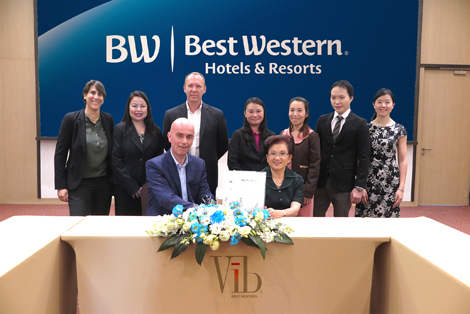 Best Western has signed a contract with Matasiri Company to develop the first ever Vib hotel in Bangkok. Vib is Best Western’s newest brand, which it launched last year. Short for “vibrant”, the brand has been described as a technology-centric hotel concept that caters to modern travellers. Each property aims to incorporate the local flavour of its market and deliver comfortable and chic guestrooms. Vib Bangkok is due to begin construction in June 2016, with completion slated for Q1 2018. The 89-room hotel will be located near Phahon Yothin Road, within walking distance of Sanam Pao BTS Skytrain station and alongside several office towers as well as the Channel 5 TV station. The group is also looking to increase the number of rooms offered across Thailand, with new properties planned in Bangkok, Chiang Mai, Chiang Rai, Pattaya and Hat Yai. Olivier Berrivin, Best Western’s managing director, international operations, Asia, expressed confidence in the Thai market, where the group’s regional head office has been based for the last 15 years.